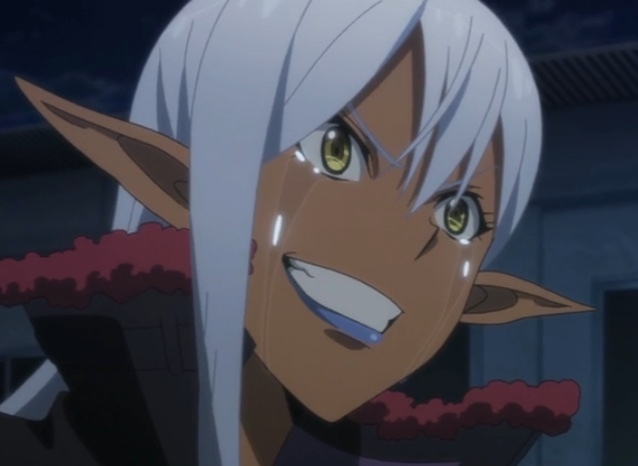 “Tuka Luna Marceau,” Gate‘s fifteenth episode, shows the lengths to which Yao Ro Dushi is willing to go to save her people. And though I can’t hate her, I am seriously displeased at what she did. 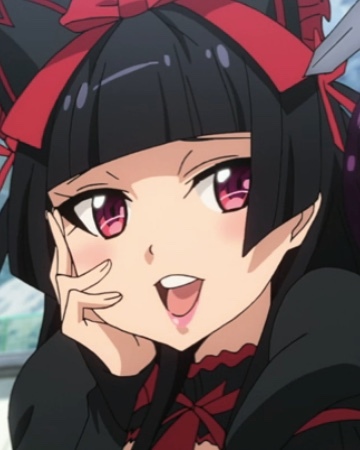 Brave enough for a Rory Mercury body pillow? You can buy one from Amazon now! Akira Yanagida tells Yōji Itami that Yao Ro Dushi asked the JSDF to destroy the fire dragon and save her people. Itami could guess the response. Yanagida says he can give Itami an excuse to go on the mission by calling it a resource recon mission. Itami refuses, unwilling to subject himself or his people to such danger. Yanagida cryptically tells him to visit Tuka Luna Marceau. He finds Tuka in tears as Rory Mercury and Lelei La Lalena try to comfort her. Tuka sees Itami and mistakes him for her father, and she complains that others have been trying to tell her he was dead. Lelei puts her to sleep and Rory tells Itami that Yao forced this information on Tuka. Yao Ro Dushi was so desperate to save her people that she was willing to go to any length to save them. Capture from the Crunchyroll stream. With Tuka asleep, Itami takes Lelei and Rory with him to confront Yao. She lays it out for him: she’d heard that the three Special Region women were important to Itami and that he’d break rules to protect them. Yao simply created the conditions whereby Tuka could be healed — but only by the revenge killing of the fire dragon. Meanwhile, Pina Co Lada secretly meets with her brother Diabo to tell him that their father the emperor has named their bother Zorzal as heir. Diabo is furious and tells Pina that Zorzal plans to rise up against the emperor. Diabo doesn’t know where Zorzal got the inspiration, because they all know he’s a bit of an idiot. Diabo warns Pina to be careful and give thought to whom she’s loyal. Who gave Zorzal the idea? Tyuule, locked in a cell now since Zorzal put her aside until he gets sexually excited again, receives a visit from Bouro, one of her spies, with a report from their insider in Alnus. His reward? He gets to lick her shin. Tyuule reveals that it took her a lot of work to get Zorzal arrogant enough to plan to rise up against the emperor. Her goal is to extract revenge against the empire. 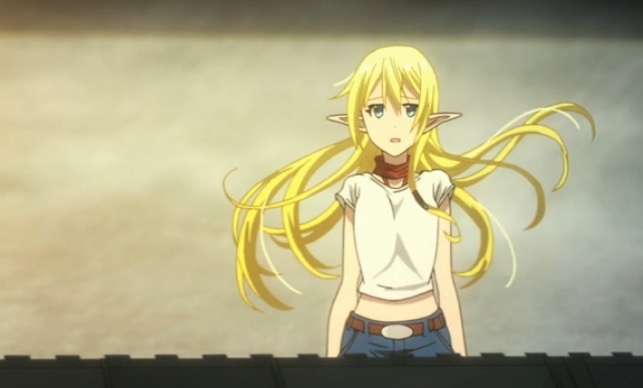 With Bouro, they come up with a plan to trick Pina into killing Noriko Mochizuki so the JSDF will turn against her and shatter the chances for peace with the empire. Tuka took comfort in seeing Itami as her father. But the illusion was fragile. Capture from the Crunchyroll stream. Itami visits Tuka while she sleeps. He recalls his mentally-ill mother killing his father and reflects on the similarities between the two situations. Tuka awakes and still sees Itami as her father. He spends the next few days pretending to be her dad as they go around and see the sites and generally enjoy each other’s company. This lasts for several days until Itami’s ordered back to the capital. Itami tries to break the news gently to Tuka, but she gets a terrible headache that she tries to laugh off. Yao explains that the headache was Tuka’s mind fighting against the differences between Itami and Tuka’s father. Time’s running out for Tuka’s sanity, Yao tells him. Itami talks to the base psychologist and even talks to Duran, who’s still recuperating from the wounds inflicted when he led his men against the JSDF at Alnus. Duran urges Itami to follow his heart. Tuka watches, trying to hold herself together, as the Itami’s helicopter takes off. Capture from the Crunchyroll stream. The next day, Tuka watches as the helicopter with Itami and his team takes off. Her expression shows a pain Itami finds he cannot bear. He leaps out of the helicopter so he and Tuka can take on the dragon. At least, that was his plan. Rory found out he was going and “gently” helped him decide to take her. In that discussion, she bit into his arm and drank some of his blood. Apparently, when he dies, she gets his soul now. Lelei, too, decided she would go with them. Finally, Yao says that she’ll go as their guide and because she belongs to Itami now. As the team departs, Yanagida seems jealous that Itami, a man who puts his hobbies first, can attract the loyalty of people like Rory, Lelei, Tuka, and Yao. I suspected Yao Ro Dushi was going to do something to Tuka, but I figured it’d be a kidnapping. Gate surprised me by going in a direction that was effective and dramatic. Rory reveals that she and Lelei had been watching over Tuka, even to the point of putting her to sleep from time to time because Tuka was so consumed with looking for her father. I thought that kind of friendship and dedication was touching. Yao’s impassioned, almost distraught speech justifying her emotional attack on Tuka blew me away. It perfectly captured her plight, gave voice to her conviction, and suggested that though she put on a brave face, guilt ate at her. “I don’t care if you do it for her,” she cried. “But save my fellows, too.” Seeing a powerful warrior reduced to that state was heartbreaking. This episode showed us Itami’s memories of his mentally-ill mother who, after killing his father, was committed to a mental hospital. Itami felt powerless to do anything to help her. I thought this was an effective character detail that justified him pretending to be Tuka’s father. I loved how the story shows Itami trying to make the right decision. He tried talking to Yanagida. He talked to the base psychologist to see if revenge might actually help Tuka heal. He stuck to his guns on not wanting to bring his people into what amounted to a personal quest. Duran turned out to be a really good counselor. Capture from the Crunchyroll stream. The scene with Duran showed how well he was adjusting to life at Alnus. I thought the advice he gave Itami bordered on fatherly. Duran struck me as a good leader. It’s good to see him having a life beyond the trap the empire set for him and his people. Yanagida was furious that Itami jumped out of the helicopter. Not because he had decided to go after the fire dragon. 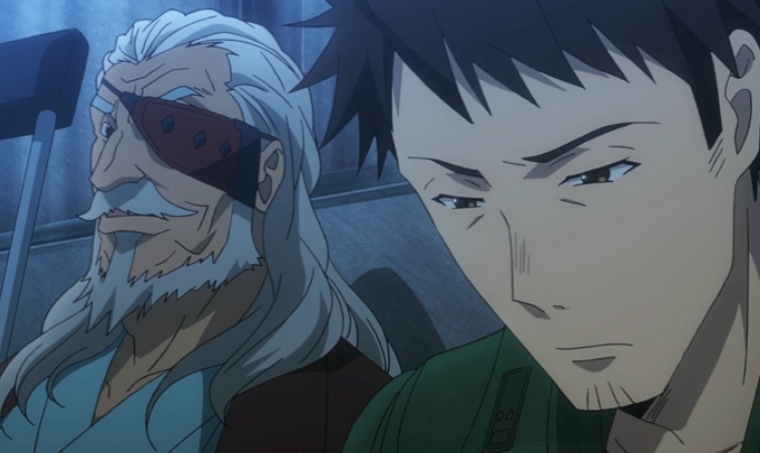 But because he had done so in the middle of an operation, which meant Yanagida would have a lot more paperwork. Military humor amuses me! I think the scene where Itami asks Rory to go with him to take on the dragon is among my favorite of the whole series. Her range of expressions never fails to delight me. Plus, she seemed to be genuinely excited by the prospect of taking on a fire dragon. 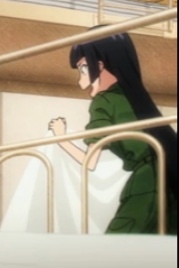 In the next scene, Itami’s arm is bandaged where Rory bit him. Cool detail! If this were an average series, having four women travel off with the one male character would clearly constitute a harem. Gate, though, went to a lot of trouble to setup the motivations for every one of the people in the Humvee. To me, it didn’t feel contrived at all, and that’s saying a lot given how many anime series I’ve seen. How did Tyuule know Noriko Mochizuki was still in the Special Region? Does she have contacts even close to the JSDF? Maybe her spy in Alnus heard rumors? Rory seemed excited at the prospect of facing a fire dragon — with Itami! Capture from the Crunchyroll stream. The second season has been one gut-punch after another. This week keeps up the pace. We knew that Tuka’s emotions were a time-bomb, and with Yao’s help, they exploded. I admire how Gate presents the character’s motivations so realistically, including the emotional distress they feel as they follow their convictions. Yao did what she thought she had to, but the guilt is eating away at her. I can’t condone what she did to Tuka. I would like to be angry with her. But what else could she do? She never directly approached Itami because all of her experience, in her world and with the JSDF, told her it wouldn’t help, and that the only way to save her people was to force Itami into it. I’m convinced Itami could see that. The usually unperturbed Rory Mercury seems shocked by something she finds while changing sheets. Capture from the Crunchyroll stream. Revenge is a dangerous thing. I think it often inflicts more damage on the one pursuing it than on the once on the receiving end. Tyuule is a good example. She had a chance last week to claim asylum when Itami’s team rescued Mochizuki. Her focus was so much on revenge, though, that she chose to stay so she could inflict as much damage on the empire as possible. That’s sad, though again, it’s understandable given her motivations. Pina and Itami’s hopes for peace seem to be teetering. Between Tyuule manipulating Zorzal and planning to frame Pina, things could get desperate fast — and Itami’s out of town. I wonder how much will be left when he returns? In case it’s not already clear, I loved this episode. Yao venting to Itami, Tuka trying to be brave as the helicopter lifted off, and Rory chewing on Itami’s arm are among my favorite scenes in the whole series. The art in this episode drove home the emotions, and the voice actors did an exceptional job. 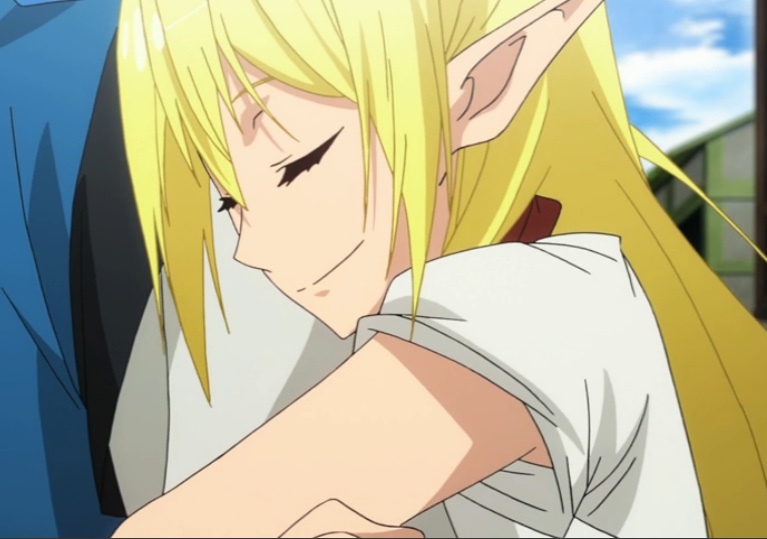 Taneda Risa as Rory in particular stood out. BTW: What does Rory find on the mattress that so freaks her out during the ED? Dimension W Episode 3: Numbered Coils Revealed!